So, IÃ¢â‚¬â„¢m a quitter. IÃ¢â‚¬â„¢m sorry Bellezza. I did last as long as I could. I read, skimmed, and eventually skipped my way to about halfway through the book. Then I skipped to the end of the book, looking to see if it got any better. But I just canÃ¢â‚¬â„¢t finish The Moon is a Harsh Mistress. I struggled through the difficult language and politics discussion as long as I could. ItÃ¢â‚¬â„¢s just not as action or adventure oriented as IÃ¢â‚¬â„¢m used to. ItÃ¢â‚¬â„¢s definitely heavy on conversation. ItÃ¢â‚¬â„¢s funny, because I can read books on apologetics and theology and not get bored, but when I read a science fiction book I guess it has to have more than just dialog and ideas. But I hope the rest of you enjoy it! IÃ¢â‚¬â„¢m glad I tried though. DonÃ¢â‚¬â„¢t get me wrong. I can say I at least gave Heinlein a shot. And now, IÃ¢â‚¬â„¢ll get back to my action-packed favorite new series – Rogue Angel: The Spider Stone. Oh, and I forgot to mention I finished the October Challenge a couple of days ago. The last book that I finished, The Nephilim, was too cheesy to even review. Serenity’s Nathan Fillion to Guest Star on Lost! Serenity star Nathan Fillion guest-stars on the Nov. 8 episode of ABC’s hit series Lost, “I Do,” which also marks the decision by Kate (Evangeline Lilly) to hook up with either Jack (Matthew Fox) or Sawyer (Josh Holloway). Fillion will play a character named Kevin in the episode, which is the last new one for a while as the series takes a 13-week hiatus, returning in February. In “I Do,” Jack makes a decision regarding Ben’s (Michael Emerson) offer, Kate feels helpless when it looks like an angry Pickett (Michael Bowen) is going to make good on his threat to kill Sawyer, and Locke (Terry O’Quinn) discovers a hidden message that may guide him through the next steps on his journey to unlocking the secrets of the island. Probably around a thousandÃ¢â‚¬Â¦ maybe two. Actually, the last book that I got was free! I won Rogue Angel: The Spider Stone on Gena ShowalterÃ¢â‚¬â„¢s blog. The Artifact, by Kevin J. Anderson. 1. The Bible. Of course, itÃ¢â‚¬â„¢s more than just a book. 2. The Chronicles of Narnia, by C.S. Lewis. This series has been a favorite since I was a child. And not only are they wonderful stories, but powerful Christian allegories as well. 3. When God Whispers Your Name, by Max Lucado. I read this in high school, and it had a powerful impact on me and my walk. 5. The Nancy Drew series, by Carolyn Keene. I have always loved to read. But when I started reading these in grade school, it took my passion to another level. They had a strong female role model, fun mysteries, and there was always a happy ending. Make sure you check out this week’s online graphic novel for more on Niki’s husband D.L., who can obviously walk through walls (and handcuffs). It looks like Niki’s “Hyde” persona might be responsible for the killings and framing of her husband. 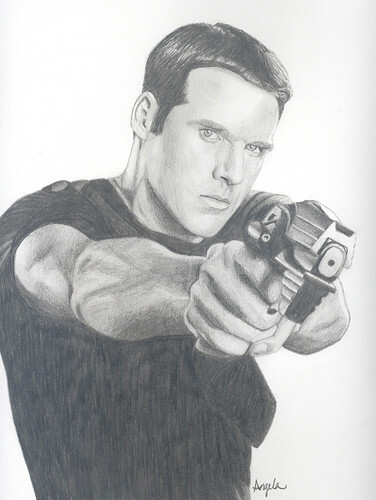 Finished this portrait of Ben Browder (Farscape and Stargate: SG1) on commission. I began two books yesterday. The Legend of Banzai Maguire by Susan Grant, author of Your Planet or Mine? which I reviewed last month. So far, Banzai Maguire has been fun and intense. You can tell Grant has a background in the Air Force. She speaks with knowledge and the first chapter reads like something out of Top Gun. I can already tell IÃ¢â‚¬â„¢m going to love this one. The year: 2006. The mission: routine. Or so U.S.A.F. pilot Bree Ã¢â‚¬Å“BanzaiÃ¢â‚¬Â Maguire thinks. Then sheÃ¢â‚¬â„¢s shot down over enemy airspace, captured and put in bio-stasis. When she wakes, everythingÃ¢â‚¬â„¢s changed. ItÃ¢â‚¬â„¢s one hundred and seventy years later Ã¢â‚¬â€œ 2176 Ã¢â‚¬â€œ the world is in crisis, and sheÃ¢â‚¬â„¢s a hotly contested prize. I also started reading The Moon is a Harsh Mistress, by Robert Heinlein. Bellezza has asked bloggers to read along with her and post comments on the 28th. I read a few chapters, but the language is annoying me, leaving out theÃ¢â‚¬â„¢s and aÃ¢â‚¬â„¢s. While there are some humorous parts, I feel myself getting too distracted by the style of writing. So far, IÃ¢â‚¬â„¢m not impressed. IÃ¢â‚¬â„¢ll keep reading though, I usually read at least halfway through a book before giving up on it. Am I alone in this? If youÃ¢â‚¬â„¢re bored or can tell youÃ¢â‚¬â„¢re not going to like a book, how long before you drop it altogether? Oh, and I have a new favorite meal.. Since I absolutely hate grocery shopping, and my fridge is bare at the moment, I stopped at KFC on the way home and got the new Mashed Potato Bowl. Mashed potatoes and gravy, cheese, corn, and chicken strips. It sounds gross (especially since I usually don’t like my food to touch each other on the plate), but mmm.. I loved it! Camy is giving away an 8 GB iPod Nano in a fun new contest that runs until January 31st, 2007. Many other prizes (books!) will be given away as well. Just sign up for her newsletter YahooGroup. And please enter SciFiChick6 as the person who referred you!